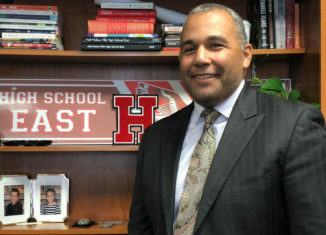 I recently had the opportunity to interview Dr. Strong and ask him to reflect on his first year as principal of Hills East, as well as his plans for the upcoming school year and beyond. Thank you so much, Dr. Strong, for taking the time to meet with me and for doing so much already to continue making HSE an amazing place. Thunderbird: The biggest change we’ve seen already this school year came during Homecoming. What did you think of the updated format for this year’s pep rally/tailgate/homecoming events? Dr. Strong: I thought it was very exciting. This year we’re trying to improve student turnout. The pep rally was enjoyed by the students and faculty, and it was great to see generated excitement down at the game. We had about 600 people at the game, so our goal to improve student turnout was met. I think, overall, that it worked, and it is something we want to continue in the future. The amazing afternoon even ended with a Thunderbird win against Copiague! TB: What are some of your goals for this year? DS: My goal is to make Hills East the best place possible. Coming in last year, I had to remind myself that Hills East is a tremendous building, and it was definitely an adjustment. I was so lucky to come into a place that was so strongly established and filled with students doing outstanding things in terms of academics, athletics, and the arts. One of my goals is to continue to provide opportunities for the students. This includes updating various parts of the building, such as the Student Center and computer labs, to make the space more exciting and current for the students. TB: What advice do you have for the students of Hills East? DS: My first year as principal went by so quickly, and it really made me realize how quickly high school flies by. Enjoy your time; we have a tendency to always look towards the future and finish things up to get to the next piece. Students, take a moment to realize where you are now and appreciate everything Hills East has to offer. TB: How has your second year as principal differed from your first so far? DS: I feel more like a part of the family. Coming from West Hollow, I think people had an idea of who I was. However, now that people see me around the building a little more, they understand that I recognize them as the freshmen, sophomores, juniors, and seniors that they are and not the sixth, seventh, and eighth graders that they were. The biggest adjustment is that I have changed my approach to various issues since I am now working at the high school level. TB: What is your opinion on technology in the classroom? DS: Technology is a great tool but can be used in a negative way. However, it is the drive of the future. Your generation will be doing jobs that may not have even been created yet. Technology is a sort of language that everyone has to learn to speak, master, and understand. We are seeing that more in the context of education with programs such as remind, the new school website, and learning management systems. At the high school level, with an increase in technology, we see more communication with a student to teacher and advisor to student. Moving forward it is a great tool that we are looking forward to continuing to provide and improving for our students! TB: Let’s conclude with some simple get to know you for our readers! What is your favorite food? DS: Pizza! I have my favorite spots around the area, and when I travel outside of New York, the pizza never tastes the same! It is definitely a family favorite. TB: How about your favorite vacation spot? DS: Anywhere with a beach and the sun! TB: What can we catch you watching when you have a few free moments to relax? TB: Last, but certainly not least, what is your favorite sports team?